Knowing what we now know beyond any reasonable doubt, that the DOJ and its underling the FBI are as crooked as the day is long, is anyone surprised they are likely busy with their latest cover-up? 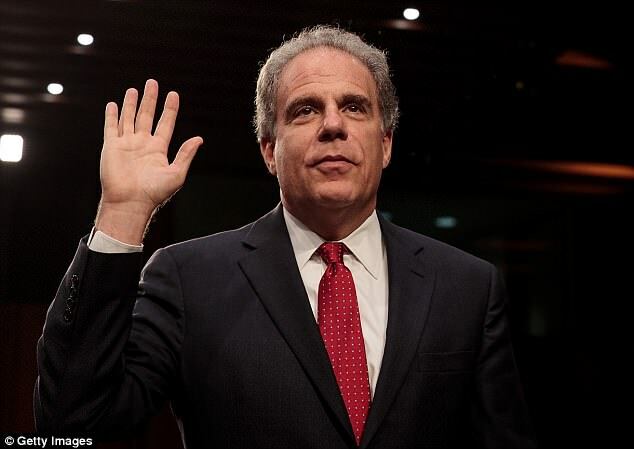 If there is a surprise in all of this it's that there is SOMEONE, so we are told, at the DOJ that might be an honest broker and that someone is supposedly the IG, Michael Horowitz. And if his report is an honest report, of course the Deep-State actors will continue obfuscating, lying and obstructing justice because telling the truth is a one-way ticket to orange jumpsuits and prison bars. -W.E. The 400-page report, which was completed several weeks ago and addresses Clinton’s use of her private server for government business, is currently being reviewed by the DOJ and FBI. According to sources, individuals mentioned in the reports are also allowed to review the document. It is expected to be “long and thorough” and will criticize the handling of the investigation by former FBI Director James Comey, who has spent the better part of the past several months promoting his book A Higher Loyalty. “It’s been almost a year and a half and it is time that Congress receives the IG report,” said Congressman Ron DeSantis (R-FL), who has been on the front lines of the battle against the DOJ and FBI’s stonewalling of lawmakers requesting documentation. “This has gone on long enough and the American people’s patience is wearing thin. We need accountability,” said DeSantis. Former FBI Deputy Director, Andrew McCabe is also expected to come under fire in Horowitz’s latest Clinton report. In April, McCabe was fired by Attorney General Jeff Sessions after the inspector general released a scathing report and a criminal referral for lying under oath. On Tuesday, President Trump expressed his frustration with the delays regarding Horowitz’s report and hinted that the inspector general may be feeling pressured to redact the document or change portions of it to weaken the blow once it is released. Last November, Horowitz’s office told Congress that they expected the report to be released, “in late winter/early spring,” noting that the latest release date would be in April. However, according to U.S. officials with knowledge of the report, the IG originally delayed turning over the report until after Comey finished his book tour promotion. Apparently, the most recent delay has to do with the review process that is taking place, the officials stated. The President also hammered Sessions, who recused himself from the Russia investigation. According to several sources, Sessions’ recusal when he accepted his appointment to the DOJ was based on poor advice from colleagues. The IG report is expected to reveal Comey’s handling of the bureau’s investigation into Clinton’s use of a private email server. He faced enormous scrutiny from both Democrats and Republicans for his handling of the case during the election and his decision to hold a press conference in July 2016 to not bring charges against her. In a turn of events, Democrats later changed their position on Comey after President Trump fired him at the request of Deputy Attorney General Rod Rosenstein, who stated that he failed in leading the investigation into Clinton. “The director was wrong to usurp the Attorney General’s authority on July 5, 2016, and announce his conclusion that the case should be closed without prosecution,” Rosenstein wrote in his May 9, 2017 letter. It is not the function of the Director to make such an announcement. At most, the Director should have said the FBI had completed its investigation and presented its findings to federal prosecutors. The Director now defends his decision by asserting that he believed Attorney General Loretta Lynch had a conflict. However, the FBI Director is never empowered to supplant federal prosecutors and assume command of the Justice Department. There is a well-established process for other officials to step in when a conflict requires the recusal of the Attorney General. On July 5, however, the Director announced his own conclusions about the nation’s most sensitive criminal investigation, without the authorization of duly appointed Justice Department leaders. Now, however, it is Rod Rosenstein who is overseeing Special Counsel Robert Mueller’s investigation into alleged collusion between the Trump campaign and Russia, as obstruction for firing Comey.